Ready to head to the Spring Mountains? We have multiple maps and guides for visitors, each tailored to the different activities and access during the warm and cold seasons. 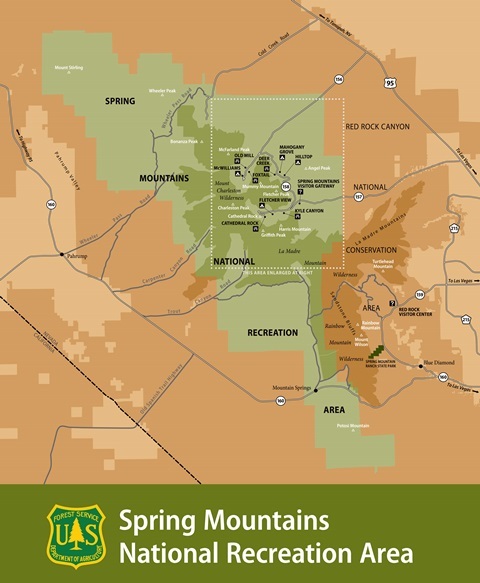 This map shows where the Spring Mountains are in relation to Las Vegas. Generally, Hwy 157 and Hwy 156 are the roads to take to the most popular areas, and they are both accessed from US95. The Area Map is a good general reference for deciding on driving routes and trail locations. This map is a good one to keep in the car or share online with friends. This handy little map will help visitors find snowy-weather recreation locations and information. 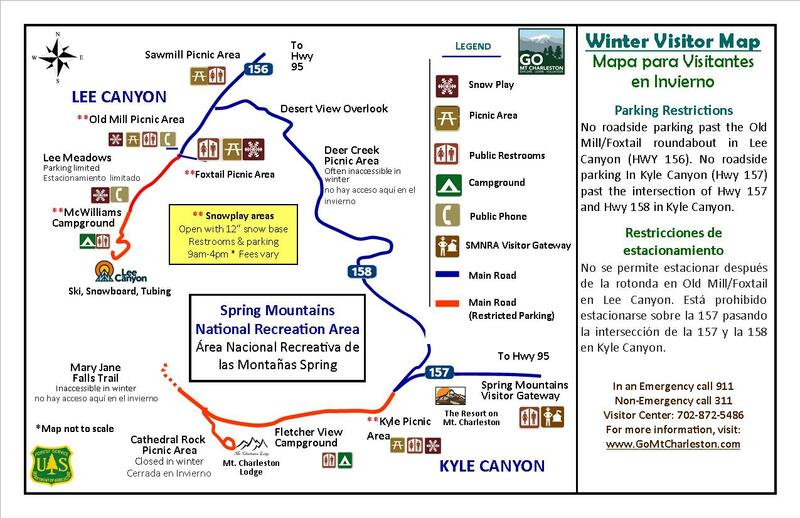 This four-page guide contains everything you need to know for a safe and enjoyable visit to the Spring Mountains during the cold and snow season, which is typically November though March. This four-page guide is a great starting point for what to do and how to get there during our warmer season, which is generally April through October. If you are ready to take your wheels off the pavement and explore, click here then scroll down to "Spring Mountains National Recreation Area" and select "North" or "South" for downloadable maps. These general vehicle trail maps are hosted by the US Forest Service and do not always contain trail information where they extend into private and BLM lands, so please check topographic maps for access points and potential trail challenges and hazards. Each trail in our Hikes & Trails section has a direct link, when available, to the USFS web page with map. Our store at the Spring Mountains Visitor Gateway also carries a wide variety of topographic and wilderness maps, and our staff is happy to help visitors find the correct map to plan an adventure.